Hello my lovelies. I hope you’ve all be keeping busy and are well on your way to be ready for Christmas. I’ve been getting plenty done and I’m almost there. I have been concentrating on nothing but Christmas for weeks. I’m getting really excited about it. I’ve done very little sewing lately. I have fallen in love with knitting socks. I’ve lost count of how many pairs I have knitted but it’s quite a few more than I thought I could ever knit. My lovely friend Lynne has taken me under her wing and pointed me in the right direction as to where to purchase nice sock wool. And she has introduced me to carbon fibre double pointed needles. I think these new-to-me needles are the bee’s knees and the cat’s meow all wrapped in one. They feel comfortable to work with because they don’t feel cold like metal ones. And the metal tips stay sharp unlike bamboo needles. So, if you haven’t tried these carbon fibre double pointed needles, I can confirm that they work for me. Once again, as in previous years I am doing a low-key Christmas. I have put just a few decorations up, a few twinkling fairy lights, a tiny Christmas tree, a bit of tinsel garland, a wreath or two and I’ll be making paper chains to give it all a vintage look. I like vintage. And I love candles; candles add warmth and atmosphere to any room. As 2016 draws to a close, I ponder the past year. Most of you who have been reading my blog posts for a while will know that my family life has changed somewhat since the turn of the year. I am now a single parent waiting for all the legalities to be sorted out. When all this kicked off just after the turn of the year I thought it was the end of the world as I knew it. I have since lived and learned that life doesn’t end when your husband decides he doesn’t want you anymore. In fact, I have learned that life has so much more to offer than I ever realised. I lived a very sheltered and isolated life for decades. During the months since separating from my husband I have experienced things I could never imagine existed. I’ve had good days and bad days from which I bounced back stronger and wiser. I truly believe that everything happens for a reason. My brand new shiny life is waiting for me whenever I’m ready to get started. 2017 doesn’t seem to be such a scary place to be going to anymore. I mentioned earlier that I haven’t done much sewing lately. Well here’s a little peek at the latest project I started …..
As you know I love appliqué work and earlier this autumn I went to a Quilts for Comfort volunteer meeting where my friend Sandra taught a fab session of quirky raw edge appliqué. This flower design is her creation which I resized smaller and added to my current project. Inspiration comes from so many different places but none more often than directly from creative friends. So, thank you Sandra for inspiring me to push on with this little project. I love this flower and I so wanted to add it to something. I have other ideas of how to use this beautiful little flower on other projects. I hope to come back in the new year with photos of this current finished piece. I have received several messages from concerned readers in the last few days. So today I thought it was important that I post something to reassure you that Sarah and I are fine and we’re both really looking forward to Christmas. Life can be a scary place sometimes but I have grown as a person over the months and realised that the most important part of life is family, reasonable health and finding joy wherever possible. The past is in the past and dwelling on it doesn’t do anybody any good. It’s time to move forward and enjoy life to the best of our ability. 2017 will put us all on the right path again. I wanted to thank everyone who has been thinking about Sarah and I. Your good wishes and kind thoughts have been greatly appreciated. And should I be silent for too long again, please feel free to contact me and I’ll be happy to email you with news. 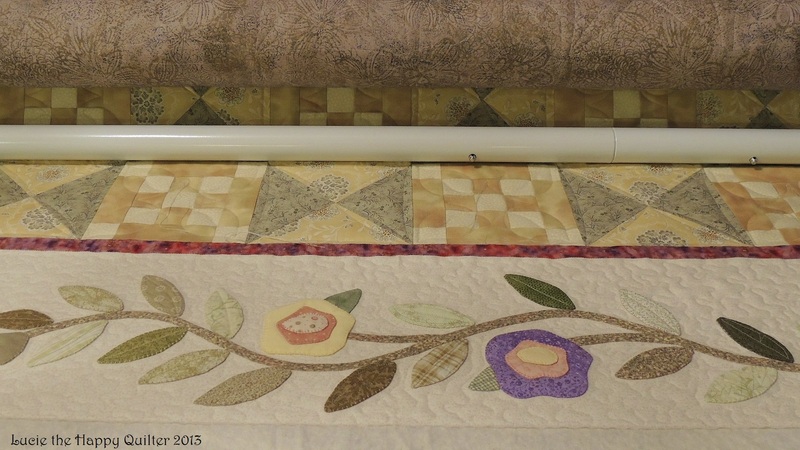 It’s been a busy day in happy longarm quilter land. I would like to tell you that it was a relaxed day but it wasn’t! My Sarah and I headed off early for a visit to the hairdresser. While Sarah was having her hair coloured I headed off, sporting my new haircut, for a quick visit to the supermarket to restock the fridge for the weekend. 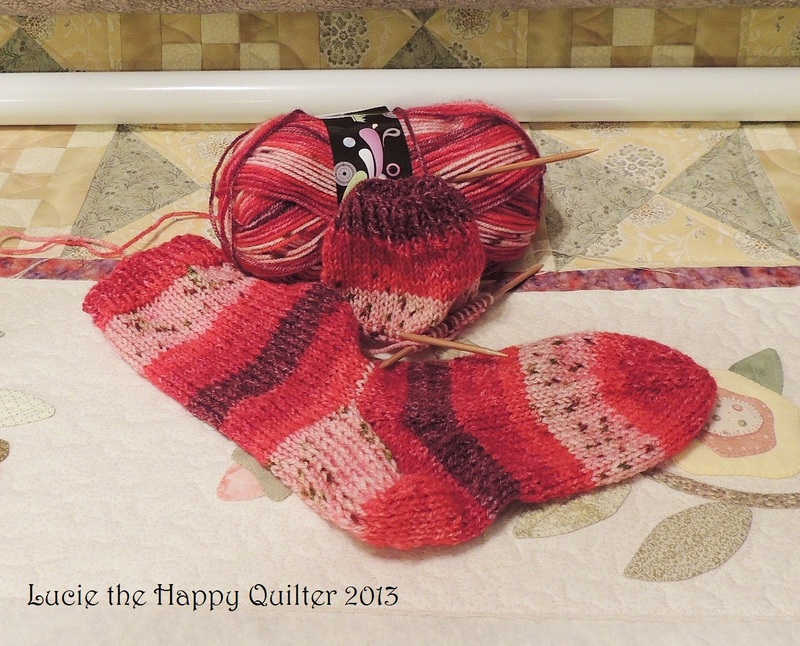 Once home again, I settled into the sewing room to do some more work on Kath’s Pink Lemonade. I spent several hours working and I can now confirm that I have finished all the stitching. First thing tomorrow morning I plan on sewing in the last of the thread ends which I created today. It’s a beautiful quilt. I can’t wait to pull it off the frame to see exactly what it looks like. I’m hoping for bright weather tomorrow so I can get some good photos. Here’s a little taster to be getting on with …..
As most of you know I had a road trip with my hubby on Thursday and Friday. 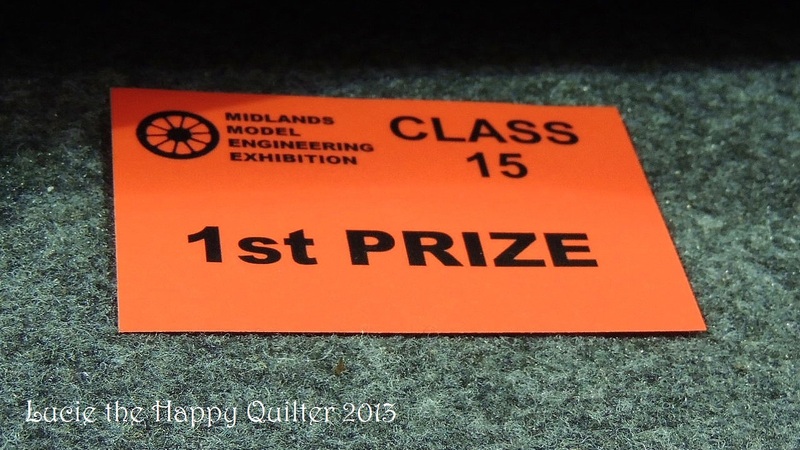 We drove down to Coventry to attend the Midlands Model Engineering Exhibition. My hubby is a marine engineer by trade. When he comes home on leave he plays in his workshop building steam engines. So it’s very fitting that we should attend the Midlands Model Engineering Exhibition. Yesterday I posted a couple of photos well here are a few more …. 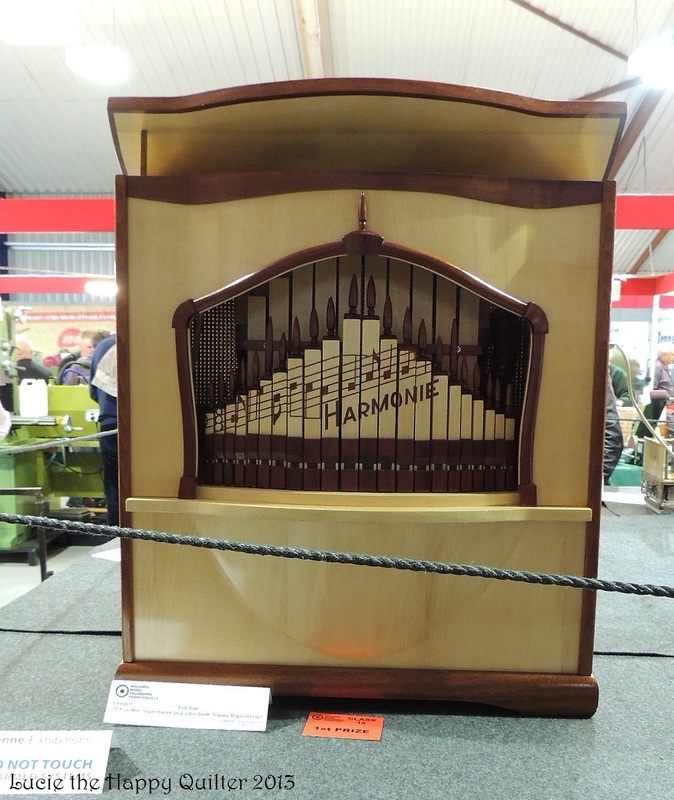 This pipe organ was so beautiful. 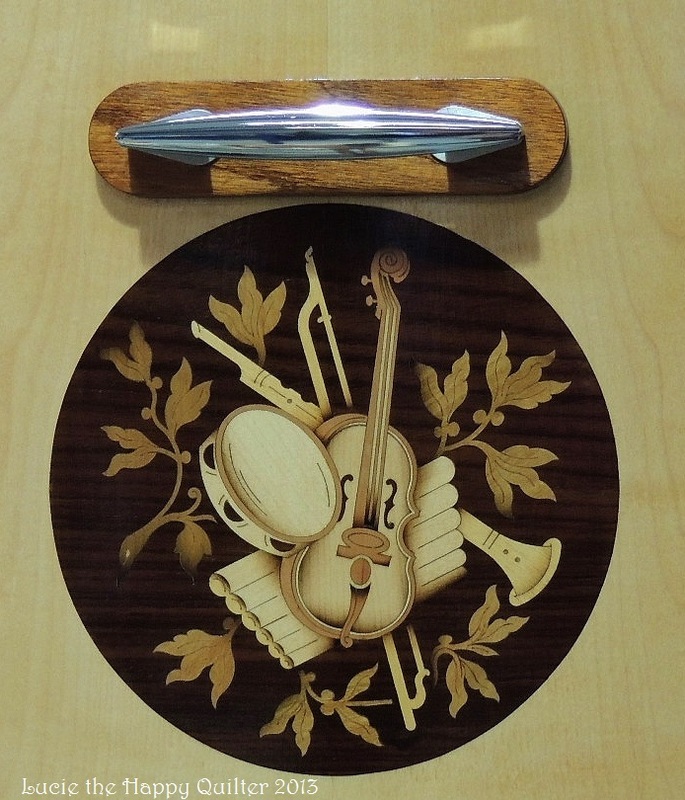 I thought I could use the cabinet for storing my precious thread ……. I’ve come to the realisation that no matter what you’re in to going to a fair is pretty much the same. I had a good look around at the steam engines on show but I also did a bit of people watching. 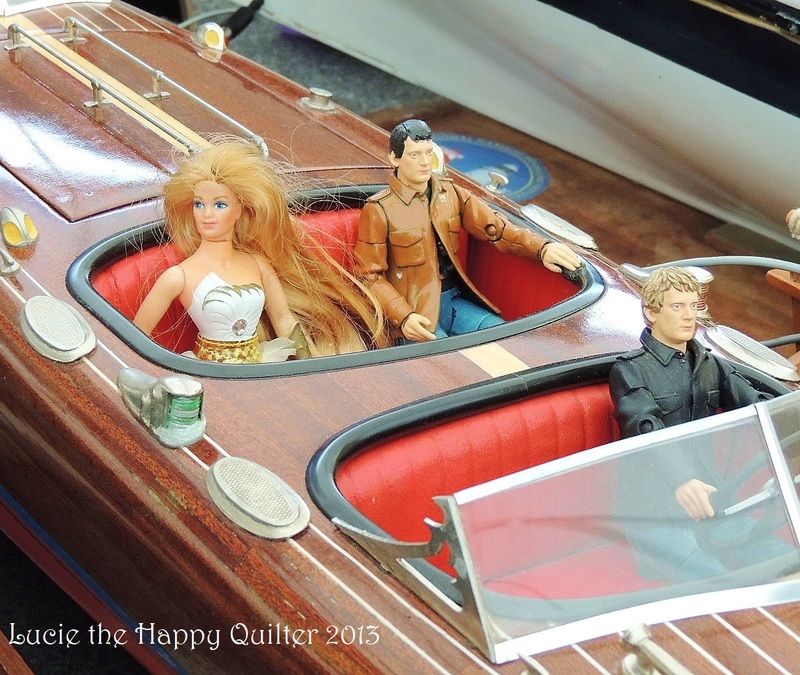 My first observation is that there were a lot more women at this steam fair than ever there are men at quilt shows …. Not only that, but there were lots of women working the trade stands as well. Now I may be married to an engineer but I really do not know a lot about engines. I do know that this is not an inexpensive pastime. Now perhaps that’s why so many wives attend these steam fairs! While I was people watching I noticed that men who attend bring a shopping list just like we women do ……. I will continue my observations about my experience on another post but I did want to post these photos of Barbie and her friends. 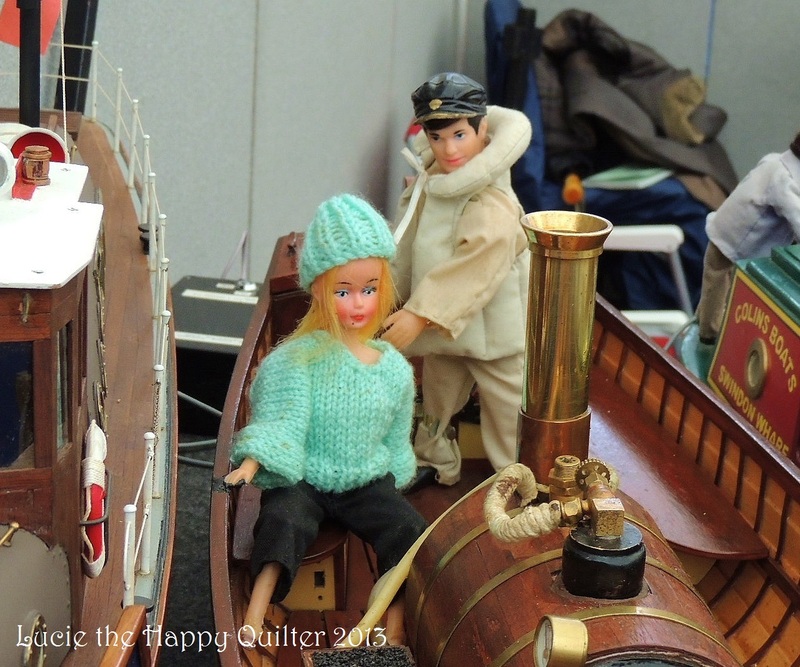 They seem to be having such a good time sailing in these model boats. 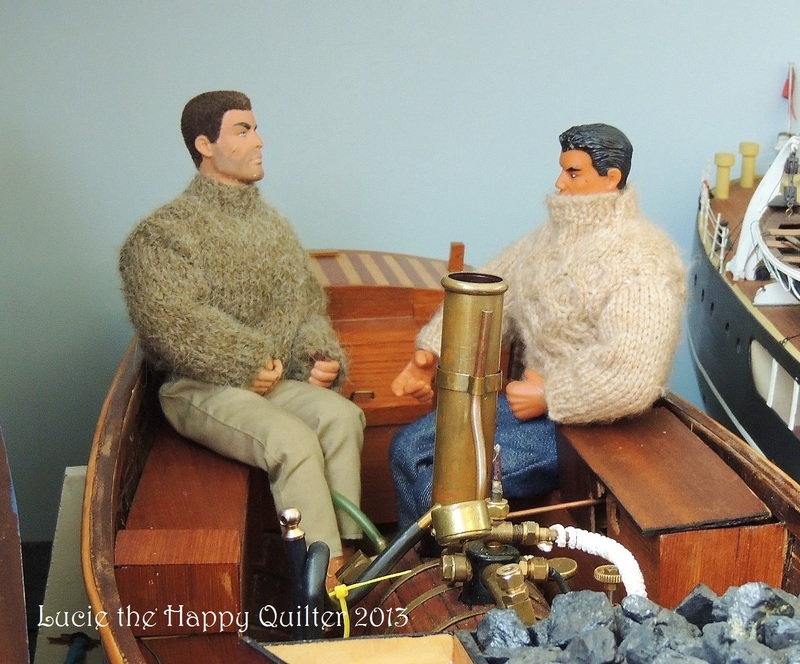 To be honest I think it was the hand knitted sweaters that caught my eye ……. I do have a little bit of knitting news this evening. I started knitting a pair of socks before I went off to Coventry. These are the easiest socks ever. I thought it would be a great way to get myself started off. I have really enjoyed knitting these socks. Even my Sarah would like a pair of these. So it looks like I’ve lost my socks ….. I had a great adventure in the Midlands but now it’s back to reality. I was trying to catch up on the washing and other chores that didn’t get done over the two days we were away. I look forward to another good night’s sleep so I can carry on catching up tomorrow. I’ve got another busy week ahead of me. I will be teaching two different classes this week. And you know what I’m like; I really put my heart and soul into getting things ready. It’s really good to be prepared.